Luke: 7 Months have Flown By! Kiddo - You are 7 months old today. I want time to freeze so we can keep you at this age, but I know it will just get better and better! This is such a wonderful age/stage, as you are so playful and content and happy. You are the very sweetest baby, and I could seriously kiss your cheeks all day long! 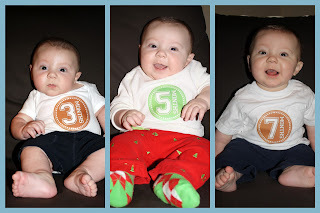 You've reached the stage where you don't have to go to the doctor every other month (big boy! ), so we don't have "official" doctor stats, but we did the at home version and you weigh 22.4 pounds, are 27.75" long and your head is 18" round. You are still as healthy as can be, which we are so thankful for! You haven't had any ear infections since you got tubes last month. You were such a champ for that, and so brave! The tube surgery took only 7 minutes, and you were only fussy until you were able to eat. You were hungry after that busy morning! This month, you had pink eye and an upper respiratory infection, but you didn't let it slow you down and you weren't fussy at all. You are wearing a size 3 diaper until the ones we have run out, and then we will be moving you up to a 4! You're growing so much that the storage unit is getting so full of outgrown clothes. You wear a size 9 months or 12 months in some things and then 18 months in others. When I went shopping for shorts and tees this past week, I bought mostly 18 and 24 months. You are one big boy! You are eating like a champ, and you prefer to eat food now over having a bottle. You're still on Similac, but you drink less and less each day. You aren't much of a breakfast eater, and you generally only take 2-4 ounces of formula and then a couple bites of fruit. For lunch, you like to have cereal, a fruit and a veggie. For dinner, you usually eat a jar or 2 of food and then before bed you have an 8 oz. bottle. Your favorite foods are corn and butternut squash, peas, sweet potatoes, and spinach. You don't love fruit, but you will eat it if it's cold. You prefer the squeezable packets of fruit over the jars. You've been eating organic Ella's Kitchen and Earth's Best food, and so far, you've done so well. You also are obsessed with the Mum Mum crackers, and I keep at least 3 packages in my purse at all times. You also love when we give you tiny bites of bread or chicken from our plates. I think as soon as you have some teeth, you'll be a table food eater. Oh - and we can't forget - you started using a sippy cup this month. While you haven't quite mastered it, you are starting to get the hang of it and like to do it all by yourself. We have given you apple juice, pear juice, and water, and you have liked all 3. Your sleeping schedule is awesome. You still go to bed between 7 and 7:30 and usually wake up now between 6:45 and 7:15am. You wake up so happy and always have a big smile on your face when I pick you up. You usually fall asleep again while taking your morning bottle, but then you are up and happy to change clothes and play in mommy and daddy's bed while we get ready for the day. This month, you started trying to crawl. You aren't the best at it yet, but you are determined. You can get on all fours so quickly and then you try so hard to get where you want to go - usually towards a toy or a shoe or mommy's phone. You go backwards no problem, but you want so badly to go forward. It will be no time at all before I'm chasing you around the house. You're doing so well in swim lessons. You're up to 4 seconds under the water at one time, and you love going and doing all the activities. This month, we didn't have to travel at all! We got to spend our weekends at home with lots of naps and playtime and just being together with our little family. We play lots of peekaboo, let you spend extra time in the bath, cuddle and watch movies, and read books. Since you don't sleep a lot at school during the week, you catch up on naps and so do mommy and daddy. Sometimes we get out of the house and run a couple of errands, but mostly, we enjoy staying home, grilling out and just being together. We've started a tradition with the Pinkstons of eating at the country club every Friday night. You are so well behaved at dinner most of the time, and you'll sit in the high chair and play with your foam toys and eat your mum mums and laugh at Aunt Am and Uncle Brad and Brooks. They love you and you love them - and I know you and Brooks will be best friends one day! The only time you boys get fussy is if we stay too late and we don't get you home at your usual bath time. You got to see Pappy and KerrBear this month! Pappy came one night after swimming lessons and bath time and got to play with you for a few minutes before bedtime, which you thought was the neatest thing. You laughed and laughed and were so delighted you got to stay up a few minutes late. That Saturday, Pappy came back and brought KerrBear, who played and played with you and wore you out. They took us out to lunch - afterwards, you took a good long nap! Your Nana and Papa also came to visit this month. You adore them, and they can't get enough of you. All of your Grandparents can't stand living so far from you and want to come see you all the time! This has been such a fun month, and you are such a sweet angel baby. I'm not really sure how we managed to live without you all these years - you bring us unspeakable joy. We love you so much and are just in awe of the blessing God has given us in you. Luke, I never ever want you to doubt how much you are loved by so many people. You are such a very special boy and we are so happy to call you ours! ...But the Greatest of These is Love! Happy Valentine's Day! While we don't do this holiday up big in the Dorsey household, this year I am beyond thankful for this cutie-pie love bug and the man he calls Daddy! 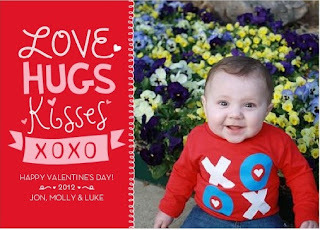 Hope your day is full of hugs and kisses!